The mechanism known as innate or natural immunization is passed down from parents to offspring in the mother’s womb itself and varies from species to species. The human body has an inbuilt defense system to counter many health related issues and problems, while some other diseases are countered by giving vaccination to the children after their birth. 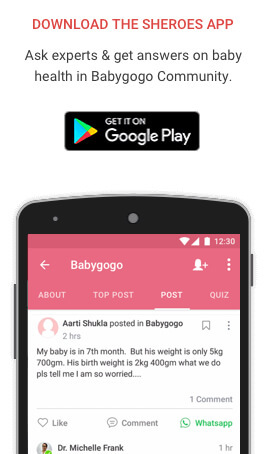 If you wish to consult a Child Expert personally for free, then join the Babygogo Community on SHEROES App. Before seeing the vaccination schedule for newborn babies, let’s first understand how a vaccine works. To download and save the Vaccination Chart for Indian Babies scroll till the end of the article. These are some vaccines which have to be given right after the birth of the baby, before it gets discharged from the hospital. Your little one now, has to receive another dose Hepatitis B at the age of 6 weeks. At this age, the baby will also be given the first dose of DTP to prevent against tetanus, pertussis and diphtheria. The last mentioned vaccines are not compulsory, but you should give it to the baby. At 10 weeks, the child will get another dose of DTP as well as oral polio vaccine (OPV). The baby will also get the second dose of haemophilus influenzae type B vaccine, rotavirus vaccine, pneumococcal conjugate vaccine and IPV (inactivated polio vaccine). Now, take the baby to the clinic for the third dose of DTP vaccine, Haemophilus vaccine, conjugate pneumococcal vaccine, hepatitis B, another dose of oral polio vaccine and IPV. Currently, two typhoid conjugate vaccines, Typbar-TCV and PedaTyph available in Indian market; either can be used. You have to provide the baby with the varicella vaccine at this age. The vaccine is given to protect against chickenpox. After one year and six months of the birth, another dose of hepatitis A is to be given to the baby. A booster dose of Typhoid conjugate vaccine (TCV), if primary dose is given at 9-12 months. Second dose of Varicella(Chickenpox) can be given at anytime 3 months after the first dose. Thrid dose of MMR is recommended for a 4-6 year old child. Last and the fine dose for Tdap and first dose of HPV is given to the baby. Second dose of HPV is to be provided to the baby at 11 years. And, here your baby’s immunization gets completed. Watch video to know about the importance of vaccinations and how vaccines work to prevent your baby from different viruses. The traditional way to track all these things is to keep a vaccination chart. The smart way is to use a vaccination tracker with Babygogo mobile app. 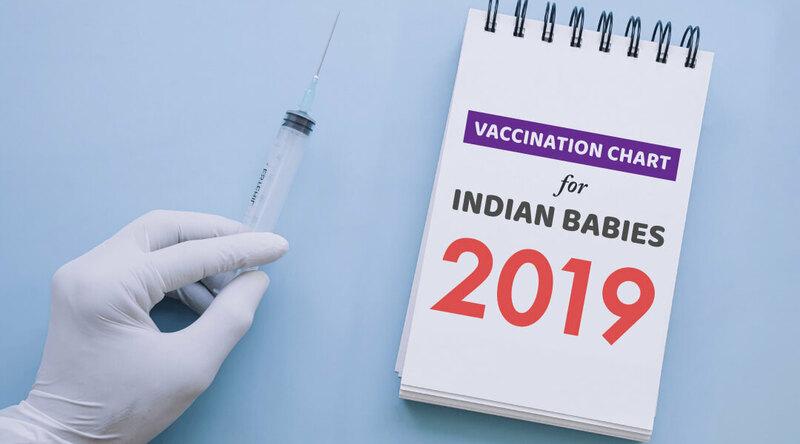 The Indian Government has provided the list of certain vaccines to be mandatorily given to children. These vital vaccines are available at a very low price in government hospitals. Given below are the vaccinations and their importance with the cost. Years Old Varicella The vaccine is also known as a chickenpox vaccine, and protects against the same. We all have heard the common phrase – “Prevention is better than cure”, the same is the purpose of the vaccination, to provide protection to the body before the infectious agents enters into it. As mentioned in the above video, it is exposing your baby’s body to a certain strain of bacteria or viruses so as to make its immune system develop immunity against such agents. In addition, try to include as many immunity boosting foods for your baby as possible, so that your baby can develop natural immunity against infections. NOTE – As soon as you find that the baby has been affected by any kind of allergy or anything irritable, do not give another dose of the vaccine, may it be the first dose or consult your baby’s paediatrician for a better advise. Some babies get the infection after been vaccinated against it. Do not panic, as that would only be the temporary one and will help your baby to build immunity against the particular bacteria or virus. 1. All vaccines are important. Never miss a vaccine for your child. If you miss a vaccine, approach your paediatrician. Sometimes vaccines can still be given, so do not hesitate to contact. 2. In case your child is having fever do not cure it with medicines and inform your doctor before immunization. Your doctor may reschedule. 3. Sometimes Doctors give you option of painful or painless vaccines. Know the difference between painful and painless vaccines to make an informed decision. 4. For some vaccines, it’s normal to get fever for a few days after administering. You can use a sponge bath to reduce the temperature or home remedies also works wonders in case the fever lasts for longer duration. Visit your doctor in case fever persists beyond that. 5. Have another family member or your spouse, assist you to distract and comfort your child while the shot is given. Carry your child’s favourite toy, blanket etc. to comfort them. 6. Sure that, you never want to miss out on a vaccine, how about downloading and saving the complete vaccination chart – This PDF has it all from – what age a vaccine should be given and their importance to their costs. Write to us in the comments section below if you have any queries regarding kid’s vaccines. Actually my EDD was 5-Nov. I had delivered a baby boy on 12-oct i.e at 37 week. When I went to Doctor, she has calculated 6 vaccinations from my EDD instead of my delivery date.is it ok? Are you wondering if your baby should get a pneumococcal vaccine shot or not? Make an informed decision after reading this article. my baby date of birth is 15-12-2014, in Dec-17 1dose and Jan-18 1dose total 2dosage we had given pneumococcal vaccine , the doctor said that 1more vaccine and 1 booster have to give total 4dose each 3800 is that cost correct and the dose ml doctor not showing us ,please share picture of dosage in syringe .please guide us. My younger daughter is going to turn 5 years old in the next two months. Today, I got the new vaccination chart. Does, DTwP B2/DTaP B2 and Varicella2 vaccines are mandatory? Please guide me. Thank you!! Please provide vaccination schedules and vaccines with prices for our infant baby of 1 month. My baby is 2 month 21 days old,during 6th week pcv is missed and 2 drops of rotavirus is also missed and in 10th week again pcv is missed.is there any possibility to give them now? My baby has completed 2 month..
my baby just completed 15 months, what is the cost of MMR2, PCV booster and vericella vaccines. my baby just completed 15 months, what is the cost of 15 months vaccines MMR2, Pneumococcal conjugate vaccine booster and Varicella. My Baby Boy is today 26 weeks old and we have missed Roata Virus and Pneumococcal vaccine first does. please guide me shall i vaccinate him rest of Rota Virus 2 and pneumococcal vaccine 2 or need to give him first dose of both Rota Virus and pneumococcal vaccine? Sorry, My baby age is 16 weeks old today not 26 weeks. Pleased tell me which vaccine are provided by govt of india under mission indradhanush? Great blog post. Thanx for post this helpful article. According to the Recommended Immunization Schedule for Persons 0 — 6 years of age, children may receive up to 24 vaccinations to protect them from up to 14 diseases by the time they’re 2 years of age. I want to suggest you one of the best child vaccination in India. Please mention which vaccine are you talking about. Today gave BCG, polio dose and hepatitis b vaccine is it ok.. Yes it is fine to give all these vaccinations. Sir my baby is 15 days. Today 3 vaccine is given BCG polio dose and hepatitis b is it ok.. Please tell me is it ok .. Yes you can give the PCV vaccine. Do follow up the doses accordingly after this. My girl is 2months 20 days Completed Today Vaccine Given Rotovirus 2 Given today and PCV 2 not Given. Doctor Said to give after 2-3 days its correct or not. and Please Share the Cost of Rotovirus 2 and PCV 2 in Private Hospital. Yes vaccinations can be given a couple of days before or after the date ordered. There might be a possible reason that the doctor has ordered it for another day. Regarding the costs of the vaccines, as mentioned in the article, ideally PCV should cost in between Rs 3800 to 4800 and Rotavirus between 900 to 1099. Kindly confirm the costs again with your doctor. If your child hasn’t had any PCV doses until now then you should get him the required two doses of the vaccination. My baby is 12 months old , i got a message from immune to vaccinate HEP A1 . Hepatitis A is not in Govt Vaccination Chart. is it equal to vitamin A? No, it is not equivalent to Vitamin A. Hep A is protection against Hepatitis A virus which is quite common in India. It is spread mainly through contaminated food and water. It clearly mentioned that below vaccinations is optional. Frequent passing of stool is not much of a concern. If it is more than 10 times a day and is very watery then you should consult with your paediatrician. Else there is no reason to halt the vaccination. My baby is 1.5 year old recently had vaccination of DPT booster (painless) and pneumococcal. Doctor charged rs.2500/- for DPT and rs.3800/- for pneumococcal I just wanna now is it economical as compared to the cost of vaccination in the market. Hi, my baby entered in to 4 th month , i want to best vaccination centre in hyderabad with reasonable price, please suggest. It would be best to speak to your paediatrician. Ideally IPV is given before the second dose of OPV. Maybe something can be worked out with your paediatrician based on the baby’s vaccination schedule. Hi Manish, please tell us if your baby has received any of the PCV doses. My daughter is 3.4 years old after 6 month we miss all vaccination , now can we start the again . pl suggest .and what will about the miss vaccination . 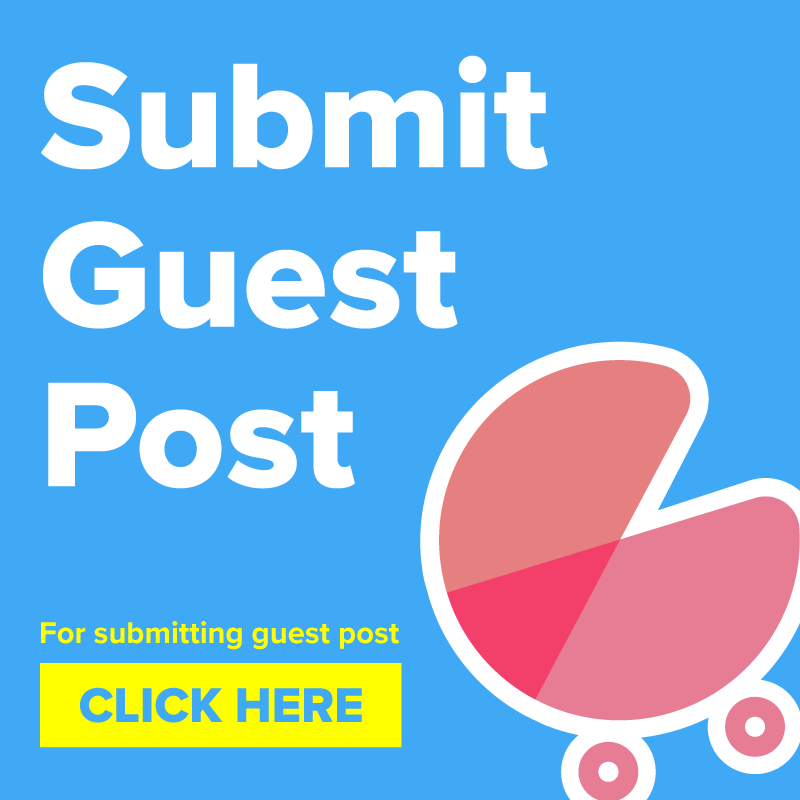 It would be best to take your daughter to a paediatrician who can assess all the vaccinations she has taken and the ones that can be given now. Accordingly a schedule will be prepared and make sure to follow it as the paediatrician recommends. Vaccinations are very important for children’s health. Though you don’t need to panic, still do follow the paediatrician’s advice carefully and don’t miss any vaccination suggested in the schedule. My daughter who is 10 months old now had vaccination of BCG, Hib, DTP, Hep-B, MMR and polio. Is this all right or she should get some additional vaccines? Has your daughter received all these vaccinations since birth? Can you please mention the doses of all the vaccinations she has received. Ideally you should have an immunization card that tracks all your daughter’s vaccinations, kindly refer to that card to see if your child is on track. And what are the next vaccinations in the series. My babby 2 year old, thyphoid,vaccine given in 2 year, but Hepetatis A, And Verricella,Vaccine in Missd, can i given Hep A,Veriicella Vacciene . Hepatitis A and Varicella are optional vaccines, thus do not stress. These vaccines can be given, just consult with the baby’s paediatrician and decide accordingly. Feel free to ask if you have any other questions. IPV stands for Inactivated Polio Vaccine. It contains only Polio vaccine. You still need to get other vaccinations done. Please follow the full schedule in the above table. You can even take a printout of the PDF for your offline reference. It was a great article. I will try to get my child vaccinated for all of these diseases. Still can you tell me when would be the next round of Pulse Polio Date? Thank for you asking us, but unfortunately we will not be able to supply you the required information about the vaccination needs of your adult 20 year old girl. I believe you will need to consult some doctors for this. the PCV vaccine price last year was Rs. 1600/- as my daughter had PCV. There r two types of pcv..one is pcv 10- cost is around ₹1600-2000/-, another one is pcv 13, cost is around ₹3800-4000/-. You can opt for any one. Pcv10 is against 10 most common pathological pneumococcal stain and pcv 13 is for 13 most common pathological strain. My baby girl has completed 9 months on 10-6-2017. The pediatrician have asked to come for influenza vaccine on 10-07-2017. She (pediatrician) didn’t told us about which type of influenza vaccine? Another thing is vaccine costs taken by her varries drastically as compared to that taken by some of my colleagues pediatricians. I want to learn about the type of influenza vaccine that need to be given to my baby as per her age and its respective cost. Timely help and guidance by anyone would be highly appreciated. Please Share vaccination and price for baby . My girl baby is 10 months 26 days. At the age 9 months, one vaccine has miss for few pimples on skin. At this time, that vaccine can be given. ‘things to remember during vaccination’ are nice, felt familiar voices and happy.